The phrase "Sustainable Development" is normally used to describe a situation in which the rich keep what they have, and the poor rise up to their level while damage to the environment and use of crucial raw materials is reduced. But the global society is profoundly above the long-term carrying capacity of the planet. So most of the rich will not keep what they have, and most of the poor will not rise. Consequently we have to change the meaning of the phrase "sustainable development". What can be a realistic and useful meaning of the phrase now, in this century? And what should be our priorities for action - personally, for our family, our city, our country to achieve sustainable development? Dennis Meadows will reflect on his 40 years of talking about the causes and consequences of physical growth on a finite planet. He will suggest priorities for research and action in the 21st century. The lecture will be held on the occasion of the opening of the academic year. Dennis L. Meadows is President of the Laboratory for Interactive Learning and widely known as the co-author of "The Limits to Growth". He started working at the faculty of the Massachusetts Institute of Technology in the late 1960s and was director of the Club of Rome project on the Predic­ament of Mankind. Further on Meadows has been a tenured professor in faculties of management, eng­ineering, and social sciences and he has developed innovative and complex strategic games. He has been the Director of three university research institutes: at MIT, Dartmouth College and the University of New Hampshire. 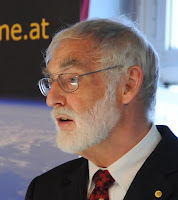 He is the Past President of the International System Dyn­amics Society and the International Simulation and Games Association. Dennis Meadows has received numerous inter­nation­al awards for his work, including the Japan Prize in 2009 and several honorary doctorates from universities in Europe and the United States. Ȋn perioada 27-28 august 2012 s-a desfășurat la Tulcea cea de-a doua întâlnire a Grupului de Acţiune pentru Conservarea Sturionilor (Danube Sturgeon Task Force - DSTF). La dezbateri au participat 28 de cercetători, oficiali și comunicatori din partea Strategiei Uniunii Europene pentru regiunea Dunării, ai Comisiei Internaţionale de Protecție a Fluviului Dunărea, ai organizațiilor guvernamentale și neguvernamentale din Bulgaria, Serbia, Ungaria, Slovacia, Austria, Germania, România și Elveția. Scopul întâlnirii a constat în definitivarea strategiei de implementare a programului “Sturion 2020” şi stabilirea măsurilor necesare promovării acesteia la nivelul UE.